I’m also guest-posting on Jenn’s blog today, sharing a few reviews of books that I’ve read recently. Go check it out! 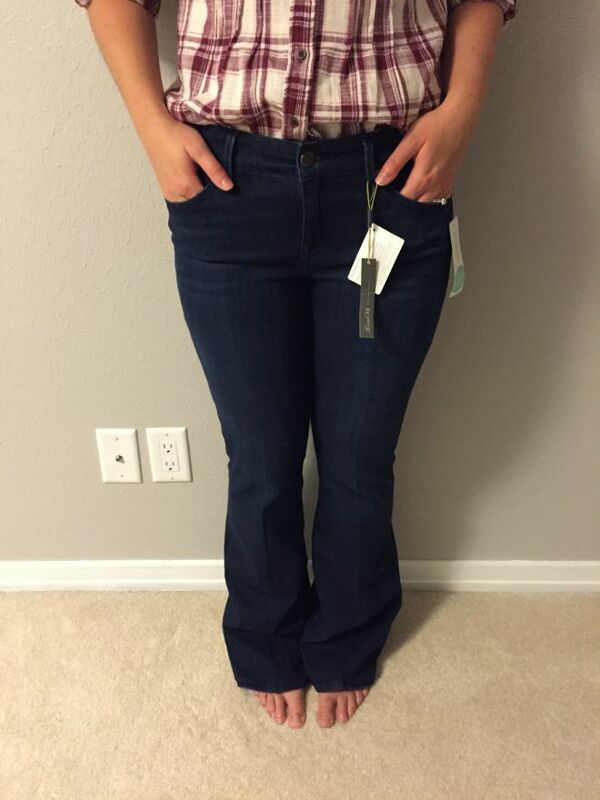 You guys … I’m officially in LOVE with StitchFix! I was so impressed with my first box – if you follow me on Snapchat (@msinthemidwest), then you already saw a sneak peek – and I couldn’t wait to share all the details with you. just log into your account at anytime and request a fix, no set subscription frequency required. I think I’m going to opt for this route or the every other month/every three months frequency since I can see how this can become highly addicting and expensive. Okay, let’s jump into what I received! 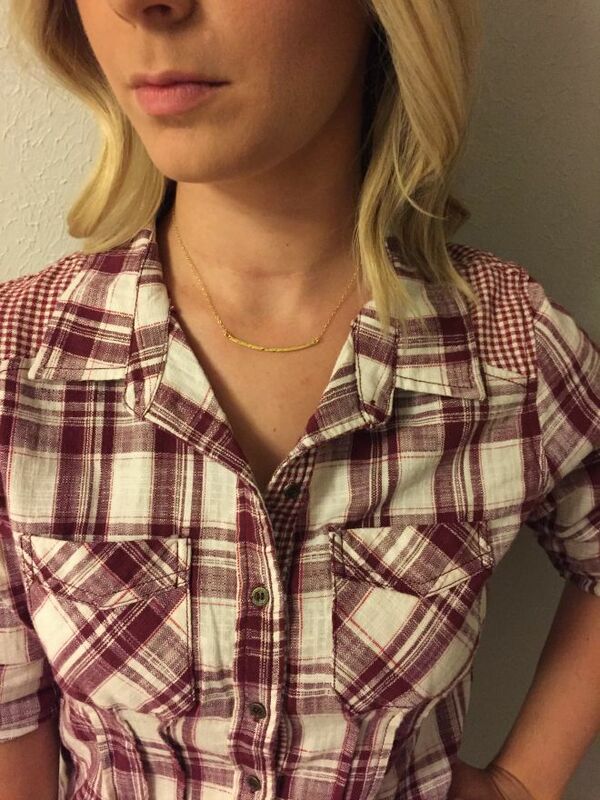 As much as I loved this necklace, I really couldn’t justify the price – I feel like I could find something similar for a heck of a lot cheaper. For future fixes, I adjusted my style profile to request that I don’t receive any jewelry. I’d rather get an extra top to try. I’m pretty sure I’m going to regret sending this top back. 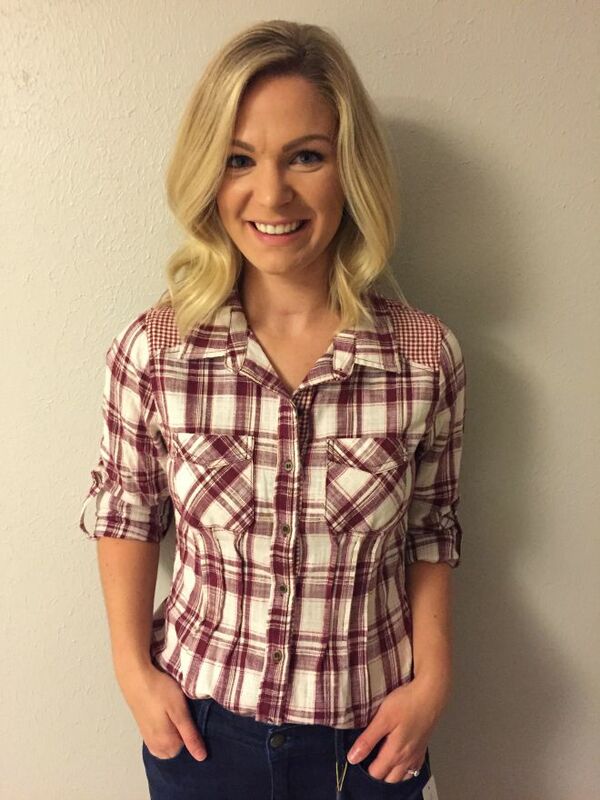 I thought the plaid and checkered accent around the shoulders was so cute and unique, and the top fit like a dream! At the end of the day, I’m always shopping on a budget, so I had to part with this one. I love, love, LOVE this jacket. I have been looking for a lightweight, military green jacket for quite some time, and this one fit the bill perfectly. It’s longer than your average jacket, and it has a detachable hood. It may be ever-so-slightly big on me, but it will be perfect come fall when I wear it over chunky knits and sweaters. With the $20 styling fee applied to this item, it only was $68. Just like everything else in this box, I was this close to keeping this pair of jeans. I loved the dark wash and how soft they were – the stretch also made them extra comfortable; however, because of that stretch, they were a size too big. I also was a tad hesitant to spend this much on a pair of flared jeans – even though I desperately want to get a pair for fall, I don’t want to spend too much on a trend that I may not like a few months from now. This dress and I had a love/hate relationship. I loved the material – it was SO soft -, the color, and the midi-length. On the other hand, I wasn’t too sure what to do with all the ruching – it’s possible that I didn’t put it on/style it right, but I felt like that style brought a lot of attention to my hips that I don’t need in my life. Plus, the price (to me) was a bit steep for basically a T-shirt dress. Overall, I was very pleased and happy with my first StitchFix! My stylist really took the time to read my style preferences, and she even noted that she visited my blog to get a better sense of my personal style. I easily could’ve kept every single item from this box, but since I’m watching my spending, the jacket made it all worth it. I definitely will be taking advantage of this service more in the future! 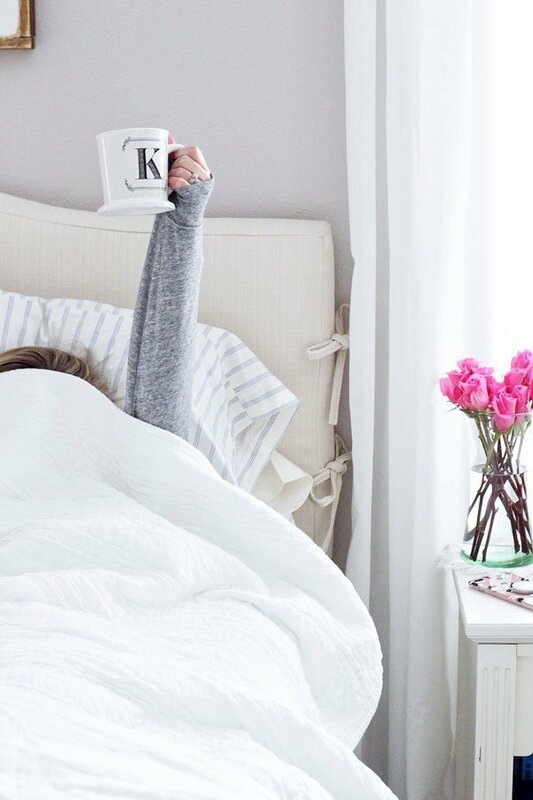 Have you tried StitchFix? Did you have good luck, or not so much? 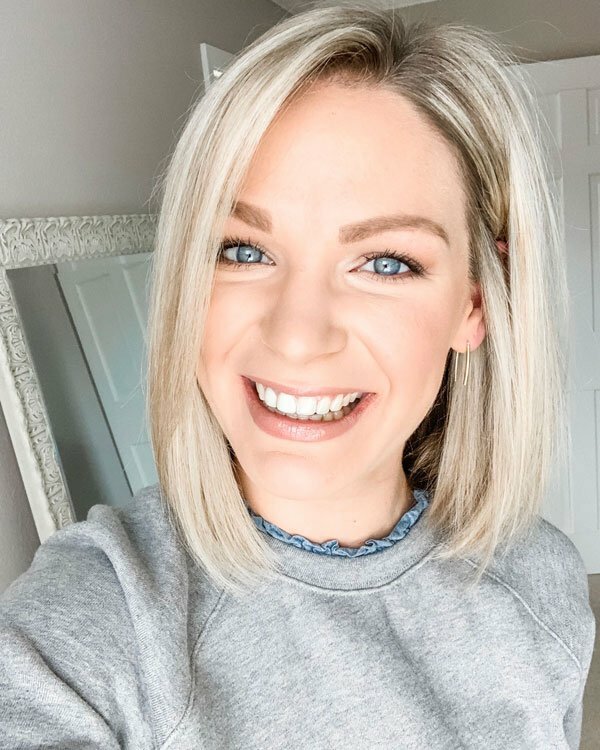 I’d love to hear more about your experience! 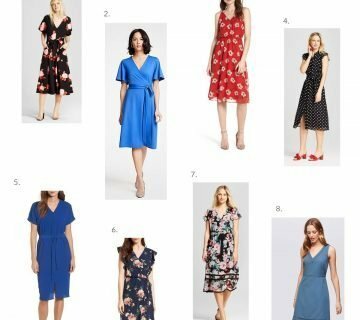 Disclaimer | This is not a sponsored post – StitchFix doesn’t know me and didn’t ask me to write this post. The links included are my personal referral link, which would give me a credit of $25 toward my next fixes for each person that signs up through my link. Thank you in advance if you decide to try it out! I am so impressed with the fit of all these pieces, they totally nailed it! An anorak is the perfect layer for fall – I lost track of mine sometime last year and I’m so bummed I can’t find it! I love seeing Stichfix posts! I always felt the same way about the Gorjana pieces I would get in my Rocksbox– I always really liked them, but definitely more on the pricey side. LOVE the green jacket you ended up keeping! Oh girl you should have kept that first top! It looks gorgeous on you! 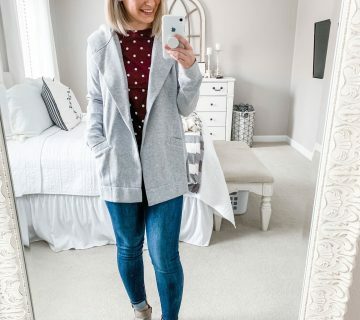 I love the jacket you ended up with- going to come in so handy for fall! Right?! The dress was way overpriced, especially for one that made my hips look twice their size. Ha! I’ve heard mixed reviews on Stitchfix, glad you had a great experience. I was nervous since I heard horror stories about the fix box, but I’m so happy with it. So glad you had a good experience – it would be fun to have this package arrive on the doorstep! 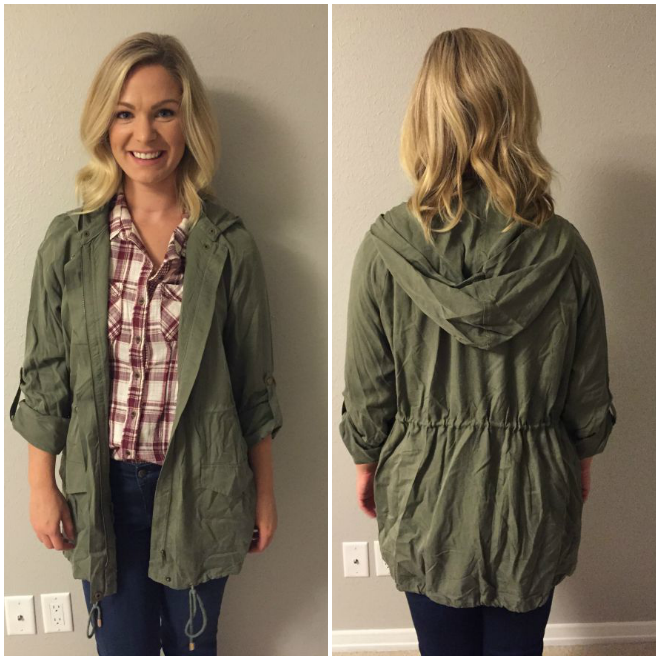 I love the jacket you kept – it’s so versatile and will be perfect for fall activities! I agree, I can’t wait to start getting a lot of use out of that jacket. And, it’s so fun to receive a box of clothes! I can see why you liked your first Stitch Fix! I think I would have kept that plaid shirt, it looked so cute on you and fit perfectly! Maybe they can send it again! The jacket is a nice piece, too. I know, I think I’m regretting not keeping that plaid shirt. Oh well, you live and learn! I actually REALLY like every single one of your pieces! You will definitely not regret keeping that jacket – I have a similar one that I wear all.the.time! Thanks, girl! Yes, I’m so excited for that jacket! Lol, you’re too funny! Trendsend definitely has a one up on StitchFix since you don’t charge a styling fee. 🙂 I’m glad this was helpful, I am beyond excited to see what you pick for me. SO glad you kept that jacket because it’s adorable! They picked out some really great pieces! Thanks, lady – I agree! Absolutely loving everything you go! That necklace is so pretty and love that jacket, so perfect for fall! That dress looks amazing on you too! I know, I’m kicking myself for not keeping that top. It fit me perfectly … oh well, you live and learn I guess!